Sometimes when I want to wallow in nostalgia for lost and long-ago times, I pull out a coffee-table photo book of paintings from Chauvet. There is a sketch on the right, student work from L'Ecole des Beaux-Arts des Grottes, no doubt. Such bears are long-gone, and while many would suspect that Cro-Magnon hunters with spears did them in, some scientists still seek other explanations for their disappearance. Climate change? Housing shortage? High-tech tools are being deployed in the search for answers. However, if the Cro-Mag boys killed one, they quite likely ate it. Did they make bear dumplings? Or did that recipe have to wait for the Neolithic, when, if you are in the Paul Shepard camp, you assert that everything went downhill. If it isn't one thing, it's another. While the War on Tamarisk proceeds, an invasive variety of phragmites (a type of reed, say it in three syllables) is now potentially a problem in the Fountain Creek drainage around Pueblo. 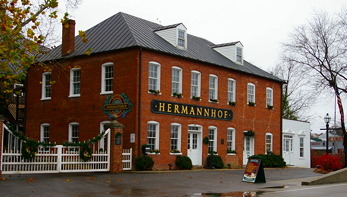 The Hermanoff winery tasting room and delicatessen occupy this building. A long time ago—three dogs ago—M. 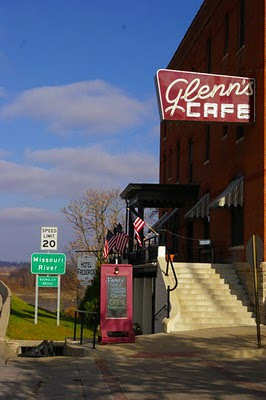 and I passed through Hermann, Missouri, after visiting my sister's farm in southeastern Missouri. We bought some white wine—most of the local wines were whites—and had a picnic. Later, after the same sister moved up to Little Dixie (Randolph County), she took Dad and me to Les Bourgeois winery, and I discovered that Missouri did offer some drinkable reds (although it is indicative that Les Bourgeois' best-selling red, Riverboat Red, is described as "a tantalizing blend of raspberry and cherry aromas, this chilled sweet red dazzles the palate with rich layers of ripe fruit." Cherry ... sweet ... ripe fruit. Uh, no thanks. Last week, M. and I visited three Missouri wineries: Les Bourgeois, Adam Puchta, and Hermannhof, the latter two in the German immigrant-founded town of Hermann, whose wine-making history goes back to the first half of the 19th century. We also had a bottle of Stone Hill's Norton varietal wine one night at dinner. 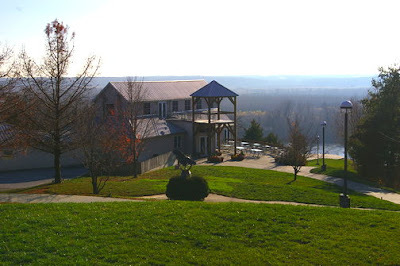 All of these wineries' dry red wines rely on the Norton grape, grown by Thomas Jefferson at Monticello and introduced to Missouri around 1860. Well adapted to sweltering Midwestern summers, the grape became very popular in the [Missouri] area. 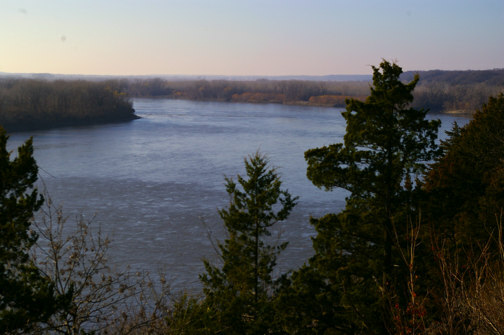 Several nurseries along the Mississippi River began selling seedlings, especially in and around the tiny town of Bushberg, just east of Pevely. Catalogs from 1870 proudly advertised Norton, which by that time had already become one of Missouri’s most popular grapes. In the 1920s, prohibition shut down the entire American wine industry. European wines regained preeminence on the world stage, a position they have been loath to relinquish ever since. But now, with American wine making a comeback, Norton is gaining momentum. “It has made a remarkable recovery,” noted Laszlo Kovacs of the Mid-America Viticulture and Enology Center, located in Mountain Grove, Mo. He specifically praised Norton as an “American grape that can be made into a premium-quality wine.” He’s not the only one in on this secret – today, Norton is the most widely planted red grape in the state. We tasted Norton-based wines at all of these vineyards, and they all have a family resemblance. I lack the fancy vocabulary of a wine writer, but compared to the California wines that I am used to, the Nortons tasted "grape-ier" (My favorite was Adam Puchta's "Legacy.") It's not a bad taste, just different from the "big" California reds that I am used to. We brought a few bottles home and will try them out on our wine-loving friends. This post's title invokes the real Emperor Norton. Faced with a big river, I keep trying to get a good photo of it. Visiting the Les Bourgeois winery at Rocheport, Missouri, for the first time in several years, I discovered that they had built a new restaurant. If that view doesn't make you feel like you want to be in a boat heading upstream (or down), I don't know what would. Next, a few thoughts on the wines. Like the late, lamented Steel City Diner in Pueblo, Colorado, Glenn's Cafe in Boonville, Missouri, hides a white-tablecloth restaurant behind a proletarian name. M. and I ate there Tuesday night and liked it. Just out of the photo to the left: the Boonslick Bridge across the Missouri River. 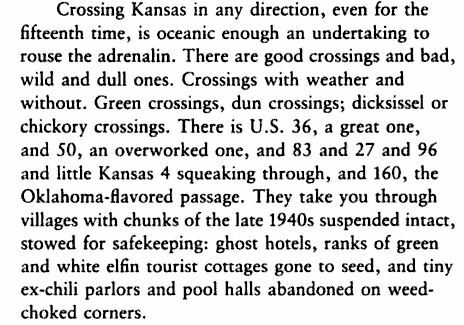 From Magpie Rising: Sketches from the Great Plains (1988) by Merrill Gilfillan. At Odious and Peculiar, Peculiar notes a characteristically Southwestern weather alert. M. and I meanwhile are still in the Boone's Lick Country (a/k/a Boonslick), where it is raining. 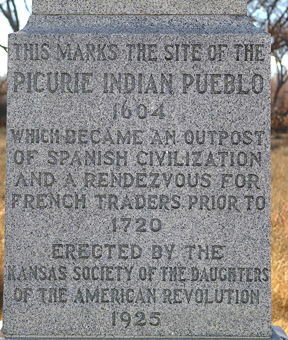 But my thoughts are in El Cuartelejo as I prepare a long historical blog post about an Indian pueblo in Kansas. 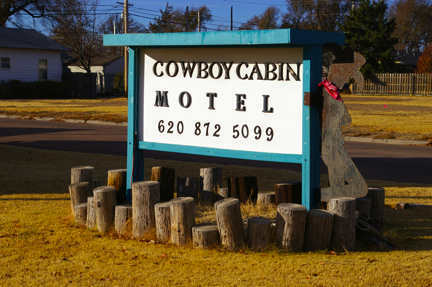 If you did not already feel like a person of low moral character before checking in to the Cowboy Cabins Motel in Scott City, Kansas, you will feel like such a person after a few minutes in your room. First, there was the sign by the office: "5 MPH THIS MEANS YOU." Ok, fine, no speeding in the parking lot. Once in the room, however, lists of rules blossom on every wall, including such casually spelled admonishments as "Do not leave doors open with air conditines on. It freezes them up and burn's compressers out." 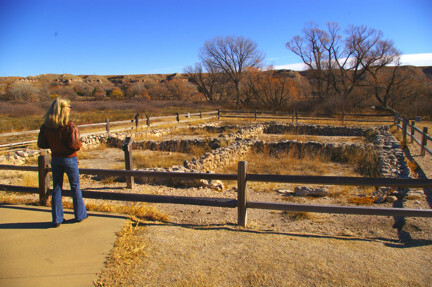 Likewise, the cold-weather guest is cautioned against leaving the door open while carrying items to or from a vehicle, lest the entire Great Plains become unwontedly warm. A surveillance camera is mentioned. And there is one in the parking lot, pointed at the owner's pickup truck, from what I can see. 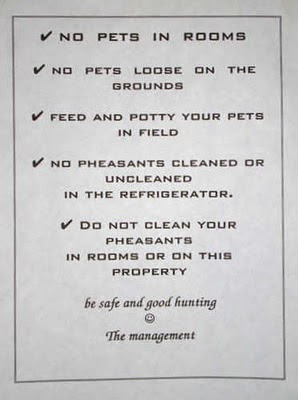 It all comes down to this: "Do not clean pheasants in the room or we will put you out." M. and I are packing for a trip to the Boone's Lick Country. For the next week, this may be a cross-country photo blog. Some small business related to my late sister's estate remains in Little Dixie, but I don't think that I need to see Moberly, Huntsville, or for that matter Clifton Hill, again. To put ourselves in the mood, we watched Winter's Bone. 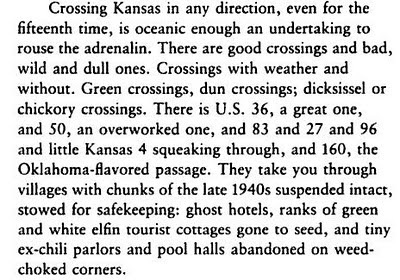 Of course, that is southwestern Missouri, not the central part. No similarities, nope, not at all, no sir. But in addition to family, we intend to focus more on historic hotels, sightseeing, and wineries. 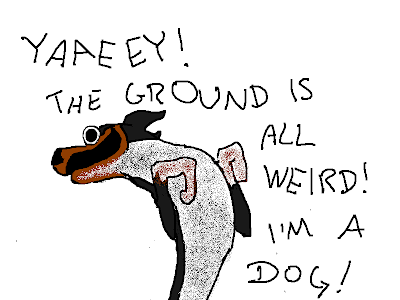 This blog post at Hyperbole and a Half is rapidly attaining Web platinum status. After six months of back-and-forth, the Internal Revenue Service has decided that M. and I do not owe an additional $250 federal income tax for last year. Not a huge amount, but, damn it, we did not owe it! If we had prepared our own tax returns and had not had our tax accountant to hold our hands through this process, we might have thought that we really did owe more money. How many people just pay up? But he generated some "Prove it, you stupid, clumsy bureaucrats!" letters, and the IRS backed down. He probably has the letter template in his computer and just inserts the clients' names. We don't make very much money, but we make it in complicated ways, filing a federal tax return fat with Schedule This and Worksheet That. 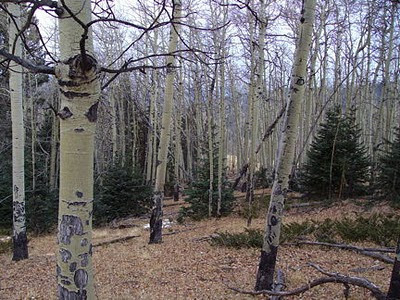 In the Wet Mountains, just before the snow began to fall.
. . . is keeping me busy right now. Those are tooth marks on the aspen bark from winter nibbling. I am trying to clean eighty-plus emails from my inbox, plant some flowers for spring, and gather my gear for the afore-mentioned elk hunt. If I get an elk (far from guaranteed), I can brag on its being "natural meat." The funny thing is, when I hunt alone and no one else is cooking, I tend to run on processed foods, the kind that are bad for you long-term. There will be an MRE in my day pack. Like what's in those? And supermarket burritos for fast breakfast while I am trying to get the dogs organized so that I can leave. I suppose a hunk of bread and some cured sausage would be more authentic. Maybe next year. Alex Wypyszinski, a retired professor and amateur photographer, shot this amazing series of photos of a grizzly bear chasing down an injured bison when he stopped to take photos of geysers in Yellowstone National Park in May. I have two days to get ready for a short elk hunt*, so I leave you with a series of photos (if you have not already seen them elsewhere) of a grizzly bear's pursuit of an injured bison right down a highway in Yellowstone National Park, courtesy of Field & Stream. Something that makes these photos even more remarkable is that [Alex] Wypyszinski didn’t use a high-end camera and lens to shoot the series. As the man (possibly Weegee) said, "f/8 and be there." Today, it's more like "fresh batteries and be there." * The elk are regular-size. The hunting period is only five days. "Why Do East Tennesseans Love Their Guns?" asks an article in the Knoxville, Tenn.,Metro Pulse, an "alternative" newspaper. The article asks why "we" are "obsessed" with guns, but it does not really try to answer that question. Given the venue, it is remarkably calm writing. Via law-blogger Glenn Reynolds, who is quoted in the story. Reynolds thinks the gun-control movement was partly driven by civic panic in the 1960s and ’70s in the wake of high-profile assassinations and mounting urban crime rates. As crime rates have fallen even while gun ownership continues to grow, he says, “Maybe we’re back to sort of a renormalization”—a society that is growing more comfortable with guns on its streets, in its office buildings, in its restaurants and movie theaters. The most-blogged gun shop in America (thanks to Tam) is prominently featured. Why do wildlife-transport calls and fire calls always come an hour before suppertime? That is M.'s lament, and to be honest, it does seem to be the pattern. This time it was Diana Miller, director of the Raptor Center, who had been contacted by some people from the other end of my county. They had picked up an injured turkey vulture—which otherwise should have migrated south by now. They were willing to bring it down our way—could we bring it to Pueblo? Well, of course. We accepted the bird at the little store out on the state highway, and they already had it in a cardboard box, so my carrier was not needed. 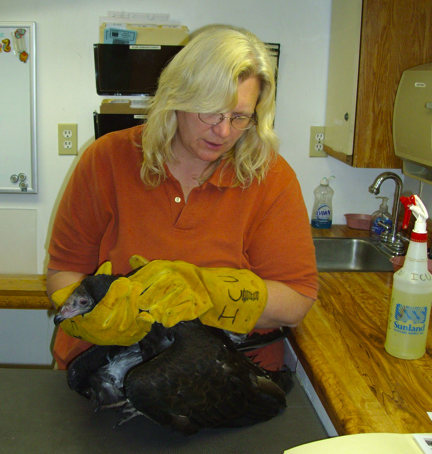 Raptor Center director DIana Miller examines the turkey vulture that we had driven to Pueblo this afternoon. She was young, hungry, and her wing injury had mostly healed on its own—but she will never be fully able to fend for herself, so she will become an "education bird," a permanent resident of the center who is taken to schools and so forth. We also checked the progress of the peregrine falcon that we transported at the end of August. She now resides in a 95-foot-long flight pen, and demonstrated that she could fly to the far end quite well, thanks very much, rather than be bothered by people. Diana said that she will be moved to a larger flight pen later this winter and released in the spring, if all goes well. We hope to be on hand for that event. Wildfire Today links to an interesting piece on western Colorado coal fires that burn for decades. I did not realize that there were so many in southwestern Colorado. It's the sort of thing that I associate with, say, Pennsylvania. Last August the Environmental Protection Agency rejected a ban on lead ammunition. Now the EPA has also rejected the second part of the petition, against lead fishing weights. 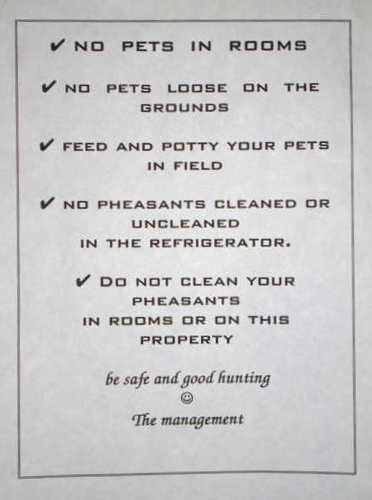 The Center for Biological Diversity, the American Bird Conservancy, the Association of Avian Veteranarians, [the astroturf "hunters group"] Project Gutpile, and Public Employees for Environmental Responsibility filed the petition on August 3 to ban the production and sale of lead based ammunition and fishing tackle under the Toxic Substance Control Act (TSCA) of 1976. EPA sent a letter to the petitioners today [Nov. 4] stating that they failed to demonstrate that the rule is necessary to protect against an unreasonable risk of injury to health or the environment. The letter also states that the increasing number of limitations on the use of lead fishing gear on some federal and state lands, as well as various education and outreach activities, call into question whether a national ban on lead in fishing gear would be the least burdensome, adequately protective approach to address the concern, as called for under TSCA. EPA's letter also notes that there are non-lead alternatives currently in the marketplace. Vermont, New York, New Hampshire, and Maine, as I understand, do ban small (under 1.0 or 0.5 oz., depending) sinkers (split shot, etc. ), partly to protect loons. I think that there is a ban on such in Canada (all provinces?) too. From the Outdoor Wire, a daily digest of outdoor-industry news and agency news releases that you can subscribe to.